Two little words that we find can make a world of difference are “adapted from.” See, this recipe, while entirely worthy as it’s published in the cookbook, gets a little extra enticing, at least to us, when we add a squeeze of lime—a necessary component of any taco, yes? So we took the liberty of tweaking the recipe to include lime as an option. Try it, if you please, and let us know. 1. Stir together the jicama, clementine or orange segments and juice, lime juice, if desired, red onion, cilantro, chile, and salt. (If using lime juice, aim to use half as much lime juice as orange or clementine juice.) Set aside. 2. Heat a large, heavy skillet over medium-high heat until hot. While the skillet is heating, pat the scallops dry with paper towels and season them with salt. Add the oil to the skillet and swirl to coat the bottom. Immediately add the scallops, one by one so they aren’t touching, and cook, without moving, until the undersides are browned, 2 to 3 minutes. (When the scallops are ready, they will move when you shake the pan or nudge them with a metal spatula because their browned crust will release them from the pan.) Flip the scallops and sear on the other side until just cooked through, 1 to 2 minutes more, depending on the size of the scallops. 4. Add the chicharrones, if using, and peanuts to the pico de piñata. Cut the scallops into 1/2- to 1-inch pieces. Pile the scallops and pico de piñata on the tortillas. Serve with the lime wedges for squeezing, if desired. Substitute 1 pound popcorn shrimp for the sea scallops. Season with salt and sauté, stirring, until just cooked through, 2 to 3 minutes. 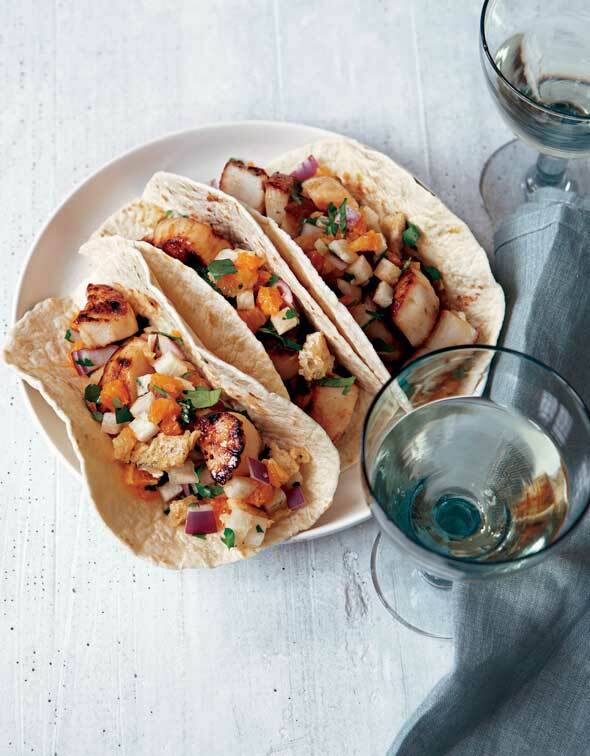 This recipe was perfect for me, because I love tacos and I love scallops. It’s a nice twist on the classic Mexican tacos. It would be ideal for a late spring or summer meal. I cut the scallops in half, rather than into 1/2-inch pieces, because I didn’t want to fuss with them too much. And I actually like my scallops slightly on the raw side, so I only cooked them on one side, I did not flip them over. Don’t be tempted to move them around in the skillet, as the scallops will release from the pan when they are done. The jicama and peanut slaw is addicting, and I could eat it by the spoonful! I omitted the chicharrones since I was making this for friends who don’t eat pork. I wanted to make sure there was enough crunch in the slaw, so I used slightly more than the ½ cup of peanuts called for in the recipe. If you’re making the slaw ahead of time, mix everything together except for the peanuts, adding them right before you’re ready to serve. An ideal weeknight meal. Light, refreshing, and easy to make. A great introduction to jicama if, like me, you’ve never tried it. While I thought this was a solid and very flavorful recipe, there’s one major change I’d make if I were to make it again. My slaw had way too much orange juice, which became an issue when attempting to pile it on a tortilla. I also feel that 1 pound of scallops seems a bit scant for 3 to 4 people, but that may reflect more my own scallop addiction than what constitutes a reasonable serving size. And lastly, I feel like the recipe could benefit from one more component—sliced avocado, maybe? This was yummy. 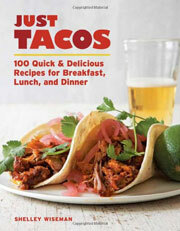 It’s a straightforward taco recipe—easy to make, with ingredients that are readily available. It would do well any night of the year. I used navel oranges instead of clementines. I think that if the habanero and onion were to be charred, then peeled and diced, they would add a smokiness that would balance the spice and the sweetness of the habanero and jicama. I think I would prefer to make a peanut-based vinaigrette to toss along with the jicama, because I found that the peanuts were a bit lost. Nonetheless, I enjoyed the tacos! Tacos with Sea Scallops and Jicama-Peanut Slaw Recipe © 2011 Shelley Wiseman. Photo © 2011 Romulo Yanes. All rights reserved. All recipes and photos used with permission of the publisher.